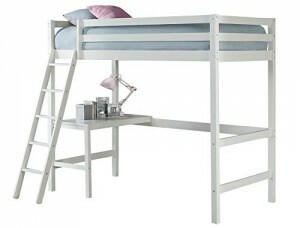 The Hillsdale kids & teen Caspian twin Loft bed in a White finish, features a simple and clean design. Constructed of solid pine wood, this simple, no nonsense Loft bed boasts a transitional design perfectly suited for your style. The desk underneath the twin bed is the perfect small space solution and an useful area that will allow time for study and creativity. Assembly required.